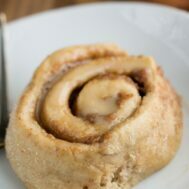 These skinny and healthier cinnamon rolls are 100% whole wheat and have no butter at all - and they just taste like cinnamon rolls. Plus, the recipe only makes 8 rolls so you won't have tons left over staring you in the face! Preheat oven to 350°F. Spray an 8” or 9” pie plate with nonstick cooking spray. While you wait, make the filling. Stir all ingredients for filling together in a small bowl with a fork. Set aside. It will be wet. Mix in the salt and applesauce using the paddle attachment. Switch to the dough hook and add 1 1/4 cups flour. Start on “Stir” for a few seconds, until the flour starts to incorporate. Switch to “2” for about 30 seconds and then kick it up to “3” until the dough comes together. You know it’s done when all of the dough will join to form a ball and the sides of the bowl are mostly. If your dough is too wet, add an additional tablespoon or two of flour (up to 1/4 cup, but I only used 1 1/4 cups total). Roll out dough on a floured cutting board to a rectangle that’s about 9x11” or so. Spread with the filling. The dough is soft! Roll up the dough into a tight roll. Cut into 8 equal slices with a serrated knife. Place in prepared pan. Bake for about 10-13 minutes, until the tops start to get golden. Make the frosting: whisk powdered sugar, vanilla, and milk, and pour it over rolls before serving.